Is caramelised white chocolate the new rock n roll? I recently discovered the method of caramelising (or roasting as some call it) white chocolate- check out my white chocolate recipe round up for the most delicious inspiration! I was intrigued so I did some Googling and found lots of very similar methods for doing it. I decided to do a very small batch just in case I messed up and burnt it, but I cracked it first time and am amazed at the difference it makes. I’ve always thought white chocolate to be bland and sweet, but adding some low heat brings out a whole new side and it seems more complex. I only did 100g and I had to stop myself from just eating it off the back of a spatula stood by the oven! Of course it helps that I was using some very good quality white chocolate. I don’t think it would work with chocolate bars that have been processed and had lots of sugar added. Left – chocolate after just 8 mins. My bag of white chocolate was calling, but what to do with it once it was caramelised? Meringues are a new obsession of mine. I’ve made quite a lot since going to a workshop at Wilmslow Kitchen Cookery School in the summer, where owner Sarah gave us a fool proof method for making them. 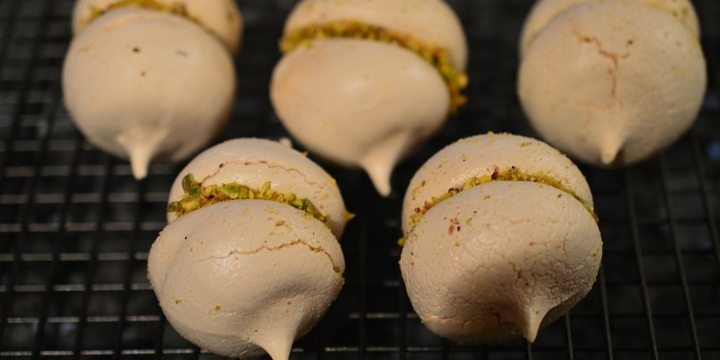 No vinegar tainting the flavour, just perfect little meringues every time. Plus, it turns out I can be quite neat when I am making them – my usually heavy handedness seems to disappear- so I am pretty chuffed with the results. Saying that, I was a bit over zealous with the ones I made this week. Using three eggs I made two dozen pairs, but had I made them a bit smaller I would have got at least 6 more pairs. They should be small. I know I’m normally serving up slabs of cake or brownie, but these sweet things look cute on the saucer of an espresso cup so think of them as being one or two bites when you are piping. I have to say these have been very popular with everyone who has tried them- I made the lemon and mint dark chocolate ones for a little party we had at the end of summer and took these white chocolate ones into work this week where they were gratefully received! This batch is lemon and mint. Lemon meringues and mint dark chocolate ganache. 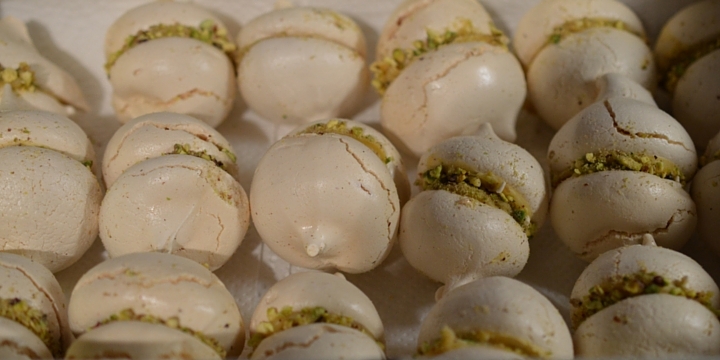 Dainty meringue shells sandwiched together with caramelised white chocolate. Beautiful little mouthfuls which are perfect as dessert or petit fours with coffee. 2. Put the sugar in an oven proof dish and heat for approx 20 minutes. It should be warm enough to stick your finger in but not so hot it burns. Do this while you complete the next step and leave the oven on when you bring the sugar out. 3. While your sugar is heating, put the egg whites in a spotless clean bowl or stand mixer, and whisk on high speed until they balloon up. 4. Slow the whisk down, add the sugar and take the speed back up. Whisk until they form stiff peaks. If needs be, stop and scrape down the sides to make sure everything is mixed and then bring the speed back up until it forms stiff peaks. Yes, you should be able to hold it over your head! 5. Spoon the mix into a pipping bag using a metal spoon. Pipe small circles onto the sheets - you will get approx 48 in total. When piping bear in mind they should be bite sized. 6. Cook in the low oven for approx. 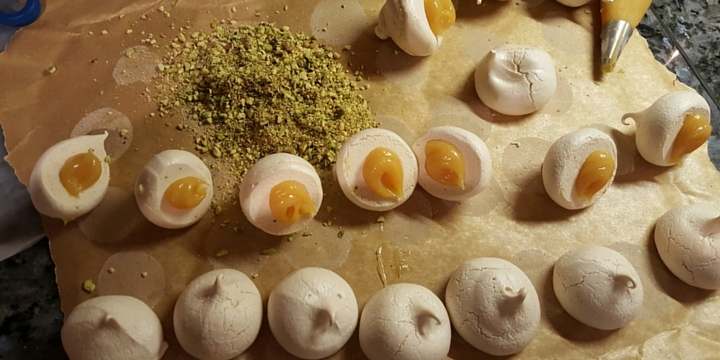 1 hour or until the meringues lift easily from the baking sheet. Place on a rack and cool. Store in an airtight tin for several days. 7. 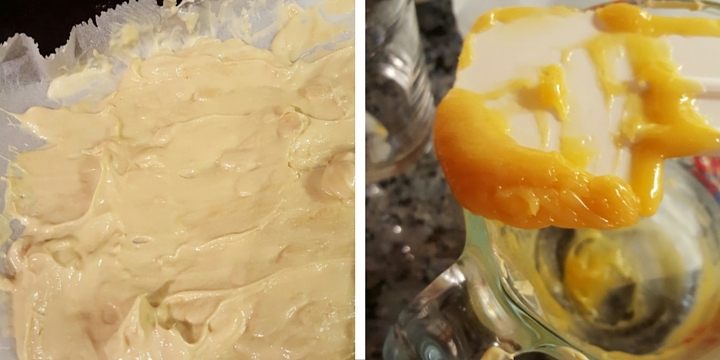 Lay the white chocolate pieces on a lined tray in an preheated to 100c. 8. Every 8-9 minutes remove from the oven and move around - always putting it back in a thin layer. After each check you will see it changing colour slightly. The smell will change as well, being more caramel-like the longer it is in. After 4 or 5 checks (so 32-40 mins) it will be a lovely deeper shade. You need to decide when you think you've cooked it enough. Too much and it will burn but you want to let the flavour and colour develop. 9. Scrape into a jug and add 50-60ml double cream, Stir well to ensure no lumps. If it is too thick, add a dash more cream. It needs to be a pipeable ganache. 10. Create a little production line! Get your ganache into a piping bag (or bowl- you can spread it on if you are gentle), your finely chopped nuts onto a board and your meringue halves together. Pipe a generous dollop in the middle of a meringue, dip the ganache in to the nuts and then sandwich with another meringue. 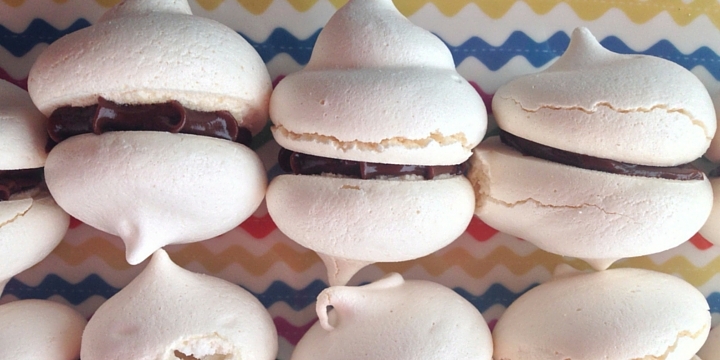 Repeat with all of your meringues. 11. 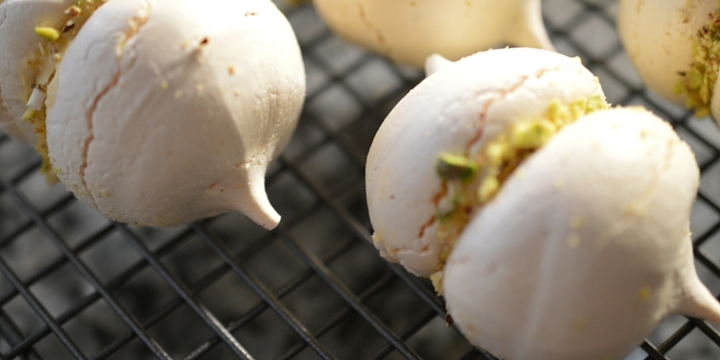 Store in an airtight container - damp is the enemy of meringue so make sure it is clean and dry before you pop them in. At the stage where your meringue mix has formed stiff peaks, gently fold in 1 tsp of lemon extract with a large metal spoon. Make a dark chocolate ganache. Melt 100g of dark chocolate in 50ml of warm double cream. Add 1/4 tsp of peppermint extract - or do as I do and use 1 drop of peppermint Spice Drops. Mix well and leave to cool and thicken. Construct as per the recipe. I’m no expert! However, I’ve had the most success with a two pronged approach. Use the little tubes of gel food colouring – mine are Dr Oetker. Squeeze a dollop the size of a 20p into the bottom. Also squeeze lines up the inside of your piping bag. Don’t be stingy, otherwise only your first few with have colour on. I’m still playing around with this and my colours have been quite muted – so be brave with the colouring or play with different brands for more vibrant finishes. 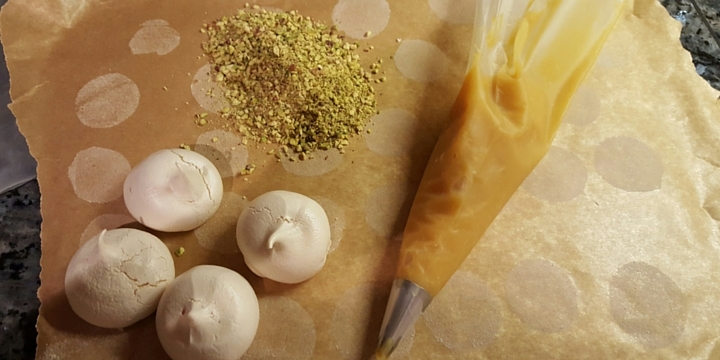 Could meringues be the new brownies for me? Well probably not but I am going to carry on experimenting with different flavour combos. And as for the caramelised white chocolate I am already plotting some blondies and some more uses for that mind blowing ganache!